Watch nature & remember how to let go. Nature helps remind us how natural, normal & necessary letting go is. Watch nature & remember how to let go. It is not something you need to “learn” to do. It is more about “un-learning”, remembering and then just allowing nature to do what is natural and absolutely necessary. Our pain, suffering and struggle often come when we resist this process, when we fight it, when we go against nature. magical and can be very beautiful. What child hasn’t taken pleasure in watching leaves fall in an autumn breeze or a sudden gust of wind? Be like a child and delight in watching the wind blow leaves from the treetops. See the leaves dance as they fall. The early October Alberta blue sky day that I captured this leaf falling, I was dancing in delight as the leaves fell from the treetops above me and all around me. 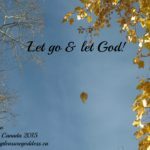 I let go of any previous agendas and everything that I thought I needed to do that day. I simply delighted in watching the leaves. I grabbed my camera. It became a playful game to see if I could capture a leaf in flight. Such pure magnificent awesome beauty in the sweet moment of surrender. Falling leaf held against the perfect blue sky. It takes my breath away. I encourage you to click on the photo so that you can see it enlarged in its full magnificence and splendor. I am sure that the leaf is smiling! To open to and embrace the next adventure, the leaf must let go of the tree. The leaf must let go of its attachment to the tree. Be vulnerable. Your aliveness, joy and freedom lie in your willingness to be vulnerable, to be seen even if it means to be seen falling totally apart. My greatest sweetest moments of joy, ecstasy and bliss have birthed themselves from my vulnerability in my moments of complete surrender, of letting go and falling completely apart emotionally. There is a deep cleansing and purification that erupts from our full on sobbing uncontrollably. Tears allow us to return to innocence, to be reborn. So cry a river if you need to, without apology. Cry for no reason. I understand myself better by observing nature, by being in nature. Watch and realize that the tree and its leaves do not fight the wind. The tree and its branches bend with the wind. The leaves allow themselves, with no thought, to be taken by the wind. Surrender to what is ready to be let go of in your life. And yes, sometimes the tree is taken down by the wind and falls onto the forest floor to be returned to mother earth, to begin a cycle anew. Sometimes in our lives, especially if something isn’t working, we have to completely tear down and get rid of the old so that a space can be created for the new. Tornadoes, hurricanes, torrential downpours, fires are all examples of how the forces of nature are at times violent and harsh in their destruction. Nature is cyclical. You are part of nature too. Spring is a time for new beginnings. Summer is a time for growth and celebration. Autumn is a time for the harvest and of letting go. Winter is a time for endings, symbolic deaths, inwardness, rest and rejuvenation. Then the cycle begins anew. From death comes new birth, new life. As the leaf decays on the boreal forest floor over the winter, it becomes food and nutrients for the fungi, for new growth that will come in the spring. Stop resisting the natural necessary change that is evolving in your life. Allow the natural cycles to flow unimpeded. In order to have new beginnings, you must be willing to let go of the old. From destruction comes new construction, new creation. Endings make space for new beginnings. Emptiness creates space. Trees rest in nakedness in the dead of winter. Stop damming up your tears. Allow all grief, all sadness to flow. Your tears like running water in the depth of your soul create the space for greater love, greater joy, deeper bliss. 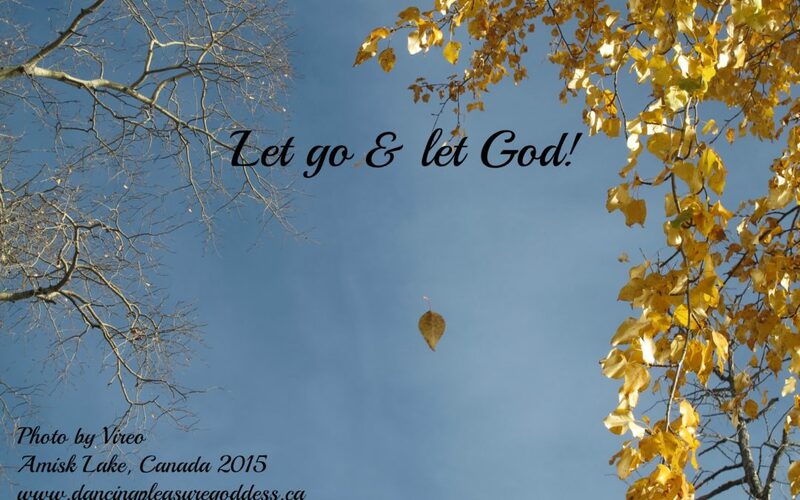 Be willing to let go of everything that you hold dear. In Buddhism they practice a mental, spiritual and emotional letting go each day. As they sit in quiet contemplation, they have a mantra that reminds them that everyone dies, all relationships end, everything will come to an end. Stop holding back your laughter, your wildness and craziness. When you dampen or hold your laughter in fear of offending another, of being out of control or of getting in trouble for being inappropriate, a part of you dies. You lose your aliveness. In the end, you actually diminish the pleasure and life force energy for yourself and all others. Laugh for new reason. Laugh till you pee your pants! As I played amidst the spiralling, floating, spinning leaves, my laughter erupted into the blue sky. I laughed full belly laughs, falling onto the ground, rolling playfully. It isn’t every day that you get to dance and celebrate with the leaves! Let your inhibitions go with the wind. 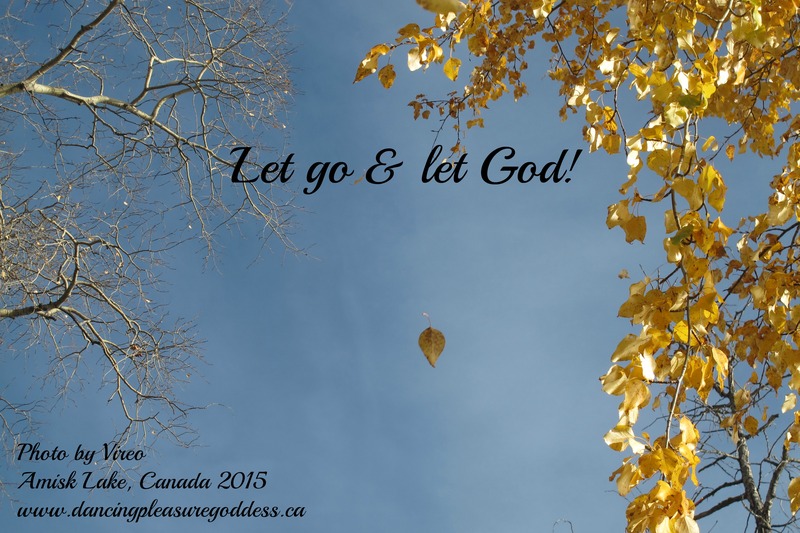 Let go and let go AND you will experience more joy, pleasure, ecstasy and bliss right now! And, one last food for thought, if all letting go and death brings new life, then perhaps there is no life and no death, only a continuation of cycles, of divinity. Maybe death is life and life is death. They are both just opposite sides of the same coin. We can’t have one without the other so in essence they are one and the same, perhaps just different perspectives, different viewpoints. So go be in nature and allow it to remind you what you already know!